The Arcanum Trojans play defense against the Hawks in CCC contest. 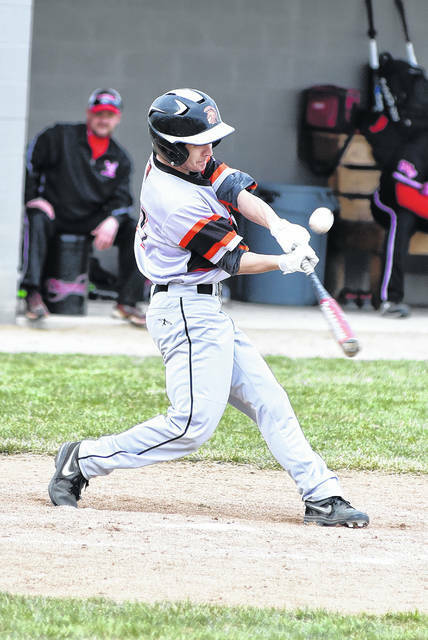 Arcanum batters score five runs in win over MV Hawks. Wade Meed throws for the Trojans in win over Mississinawa. Trent Collins throws a pitch for the Blackhawks in CCC game with Arcanum. 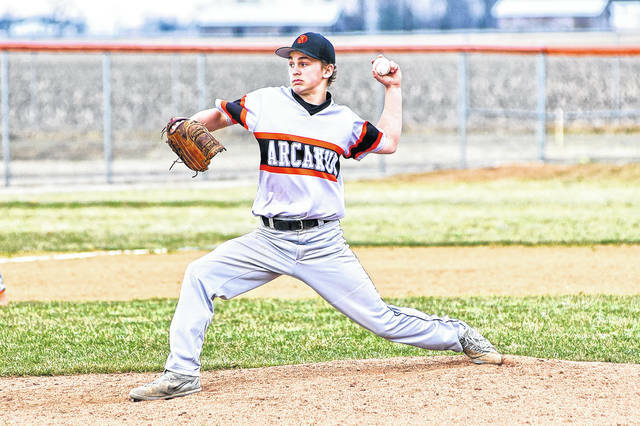 ARCANUM – The Arcanum Baseball team has won some big games and added Mississinawa Valley to the list of quality teams they have beat early in the season with a 5-0 shutout. Lane Byrne got it going in the bottom of the 2nd inning for Arcanum with a single and Evan Atchley followed up with a hard hit ball … but an error by the Hawks left all runners safe. Byrne scored on a wild pitch for the first run. Atchley stole two bases and scored on a ball hit by MIchael Feckler that included another error for Mississinawa. Feckler would eventually score to put more pressure on Mississinawa Valley going up 3-0. Trent Collins retired the first two batters by strikeouts in the 3rd inning, then Campbell Gostomsky singled and was brought home on a single by Evan Atchley to go up 4-0. Atchley was 2-3 on the day and produced the only earned run against Collins on the night. The Trojans added another unearned run in the 4th inning by Wade Meeks for the 5th run of the game. 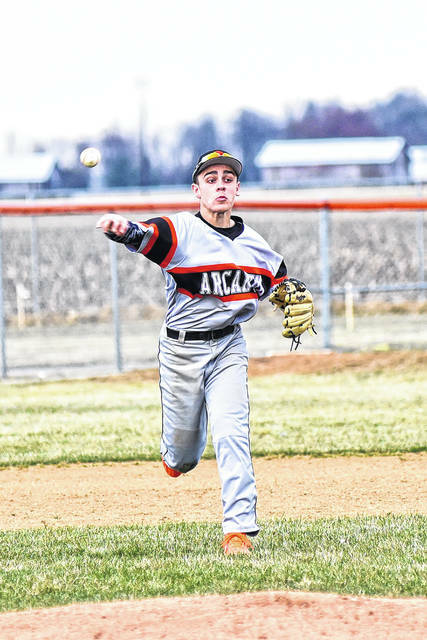 “We saw a really good pitcher tonight in Trent Collins who throws the ball really well and we’re fortunate enough to play good defense and had good pitching,” Arcanum coach Randy Baker said. “We did a good job of making him throws a lot of pitches, we had some guys go 0-2 in the count and then fight to a full count … and even though they struck out they battled which gives you a chance to see more pitches and the more you see the better opportunities you’ll have to get a hit,” Baker added. Mississinawa wasn’t able to string enough hits together but did challenge late leaving runners on base in the 6th inning and the bases loaded in the 7th inning. “Wade was really good early … but he lost a little bit there at the very end, he pitched really well and kept them off balance and only had a few hard shots by Collin. Fortunately, they were right at somebody. Wade did an excellent job of hitting spots and letting our defense make plays. Meeks would give up just 5 hits for the game with 3 of those coming from leadoff hitter Zac Longfellow, Cody Dirksen and Ethan Dirksen also had 1 hit each for Mississinawa Valley. Collins would go the distance taking the loss for the Hawks. He had 7 strikeouts and gave up just one earned run. Arcanum had just 4 hits for the game, but they found ways to score runs to win the game. “We’re fortunate we’ve played some real good competition up front this year and playing good baseball right now and finding ways to win. We’re winning in different ways, sometimes we score lots of runs and other times it’s a 2-1 game and tonight we found a way to manufacture runs against a good pitcher,” Baker concluded. Mississinawa Valley falls to 2-2 overall and 2-2 in the conference. Arcanum improved to 5-2 overall and 4-0 in the conference. https://www.dailyadvocate.com/wp-content/uploads/sites/34/2019/04/web1_Dale-Arcanum-b.jpgThe Arcanum Trojans play defense against the Hawks in CCC contest. 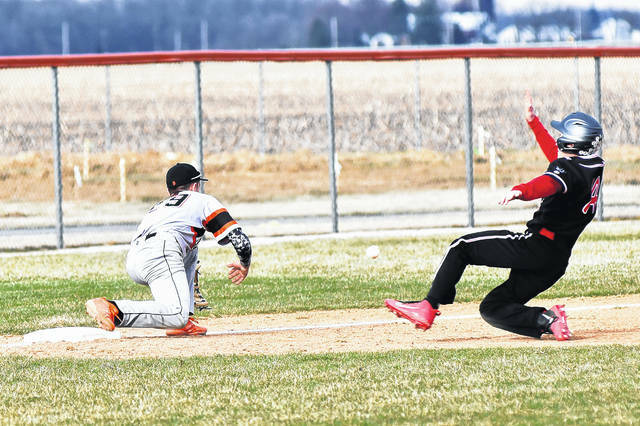 https://www.dailyadvocate.com/wp-content/uploads/sites/34/2019/04/web1_Dale-Arcanum-c.jpgArcanum batters score five runs in win over MV Hawks. https://www.dailyadvocate.com/wp-content/uploads/sites/34/2019/04/web1_Dale-Arcanum-a.jpgWade Meed throws for the Trojans in win over Mississinawa. 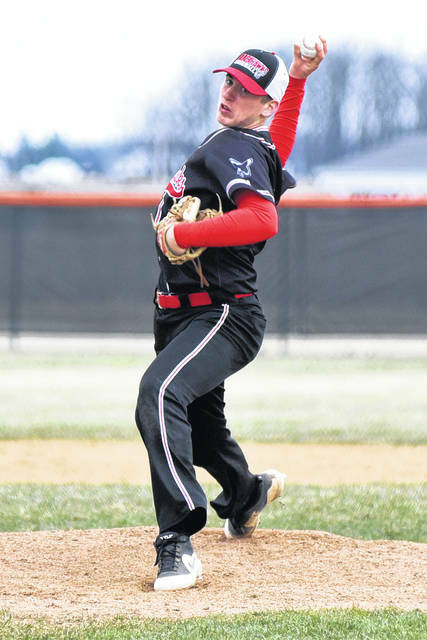 https://www.dailyadvocate.com/wp-content/uploads/sites/34/2019/04/web1_Dale-Arcanum-d.jpgTrent Collins throws a pitch for the Blackhawks in CCC game with Arcanum.